This hotel in Exeter features a saltwater pool with jacuzzi. Guest rooms include a flat-screen TV and free Wi-Fi and the hotel is one mile from the American Independence Museum. Every room at the Hampton Inn & Suites Exeter is furnished with coffee facilities, a microwave and a refrigerator. Exeter Hampton Inn & Suites includes a gym and a business center. For added convenience laundry facilities are also available. Hampton Beach and historic downtown Portsmouth is a short drive from the hotel. Hampton Inn & Suites Exeter is less than one mile from PHillips Exeter Academy and Exeter Hospital. Upon check-in photo identification and credit card is required. All special requests are subject to availability upon check-in. Special requests cannot be guaranteed and may incur additional charges. Please note that guests below the age of 21 years are not permitted. Guests are required to show a photo identification and credit card upon check-in. Please note that all Special Requests are subject to availability and additional charges may apply. 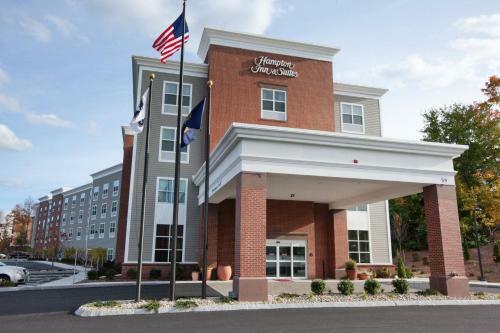 the hotel Hampton Inn & Suites Exeter so we can give you detailed rates for the rooms in the desired period.